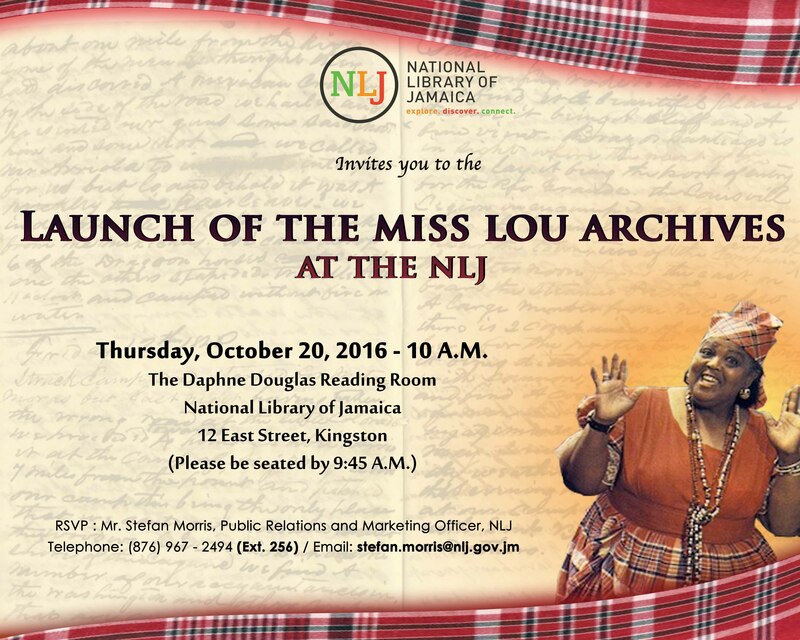 The Miss Lou Archives will be launched on Thursday, October 20, 2016 at the National Library of Jamaica, 12 East Street, Kingston beginning at 10 a.m.The archive is a collection of her unpublished and published material, including personal and professional correspondences, typescripts and photographs. Miss Lou is synonymous with the development of Jamaican theatre, language and poetry and is often regarded as the “Mother of Jamaican Culture”. For over fifty years, this phenomenal woman has spoken of and for the Jamaican people. Through her performances in the National LTM Pantomime and her publications, poems, songs and stories, the Hon. Louise Bennett-Coverley, O.J. has helped to create and archive Jamaican tradition. The Miss Lou Archives reflects the accomplishments that have given Miss Lou her unique identity and will ultimately stimulate a greater national appreciation for this Jamaican “Lady of Letters”. The launch of the Miss Lou Archives comes on the heels of the 97th anniversary celebrations of her birth. Persons participating in the launch are: The Hon. Olivia “Babsy” Grange, Minister of Culture, Gender, Entertainment and Sport (MCGES); Mr. Fabian Coverley, Miss Lou’s Son, Dr. Pamela Appelt, Executor, Miss Lou Estate and Prof. Mervyn Morris Poet Laureate of Jamaica. The launch will be emceed by Ms. Dahlia Harris.